The Museum is currently embarked on an important consultation exercise within the community. Out of this will come ambitious plans for the way the Council takes the main museum forward. Clearly this will take some time. Once plans emerge project(s) that MMF can support will be identified. Meanwhile MMF is working to support the introduction of a new donation box for siting in the Museum’s reception area. 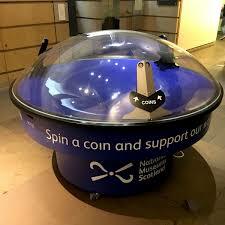 It is called a ‘Vortex’ and sends inserted coins into a visible spiral as they descend the circular box into the base. Thus it will have great appeal for everyone. The cost will be about £2,200 which will be met by MMF. Installation will be in the New Year.